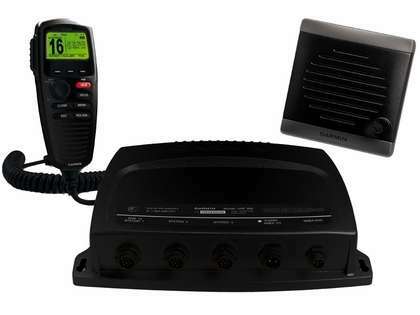 The Garmin 010-00757-10 VHF 300 AIS Marine Receiver Radio combines radio communication and 1 or 25 watts of transmit power with multi-station support, giving you the convenience and flexibility you need to safely navigate and communicate on the open waters. The Garmin VHF 300 AIS comes standard with a two-way hailer system and is NMEA 0183 and NMEA 2000r compliant, offering greater onboard functionality. Additionally, the VHF 300 AIS utilizes Automatic Identification System technology to help you identify and avoid other large vessels at sea. The VHF 300 AIS is equipped with a two-way 30-watt hailer system for communication with other boats or deckhands. In addition, the VHF 300 AIS has a voicemail feature that lets you pre-record a 15-second message and deliver the message to any Digital Selective Calling radio. You'll also have the ability to replay the last 90 seconds of any incoming voice transmission at the touch of a button. The VHF 300 AIS is operated via the GHS 10 handset microphone that allows full radio control from a remote location. The GHS 10 features a crisp 2" (5.08 cm) LCD display, dedicated rotary key for frequent tasks, and three soft buttons for dynamic controls. The VHF 300 AIS uses the supplied 4" (10.16 cm) active speaker with volume knob, the built-in speaker on the GHS 10 or an optional third-party passive speaker. The Garmin VHF 300 AIS provides full NOAA weather alerts and Class D Digital Selective Calling (DSC) capability via NMEA 0183 or NMEA 2000 connectivity. Should trouble arise, DSC provides distress calls with the push of a button. And if your boat already is interfaced with a compatible GPS chartplotter, you'll get mayday signaling and a digital broadcast of your boat's position. The VHF 300 AIS also features Position Tracking, which allows a mariner to locate and keep tabs on up to three other boats in the area.